Offering free Wi-Fi, Apartments Deti is located in a quiet area of Ulcinj, 2 km from the city centre and 1.2 km from the beach. 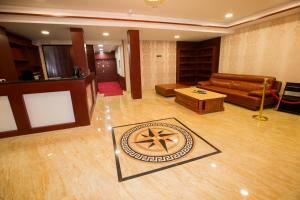 The property provides air-conditioned and all rooms and apartments come with a furnished balcony and cable TV. The Old Town of Ulcinj is 4 km away. Each unit has air conditioning and a private bathroom with a shower and a hairdryer. Some units also include a kitchenette. The nearest restaurant is 100 metres away, while various other restaurants and bars can be found near the beach. A grocery store is 100 metres from the Apartments Deti. Guests can kite-surf on the beach, kayak or enjoy the gastronomic offer on the Bojana River and visit the Skadar Lake National Park, 30 km away. Local bus with frequent lines around the town stops 15 metres from the property. Main Bus Station is located 1 km away. Podgorica Airport is at a distance of 76 km. Public parking is available free of charge. When would you like to stay at Apartments Deti ? This double room features a balcony, seating area, a wardrobe and a bathroom with a shower. It includes a basic kitchen facilities and a fridge. This air-conditioned studio features a balcony, seating area with an LCD TV, a wardrobe and a bathroom with a shower. It includes a kitchen with a stovetop and a fridge. This quadruple room features a balcony, air conditioning, seating area, a wardrobe and a bathroom with a shower. It includes a basic kitchen facilities and a fridge. This air-conditioned apartment features a balcony. The living room comes with an LCD TV, while the kitchen comes with stovetop, a fridge and a dining area. The bathroom is fitted with a shower. Please inform Apartments Deti in advance of your expected arrival time. You can use the Special Requests box when booking, or contact the property directly with the contact details provided in your confirmation. Each day we'll check prices and send you an email for your selected dates at Apartments Deti. If you don't have specific dates but would like to check prices for say next weekend or say next month we can check the price too. Click to write a review and share your experience of Apartments Deti with other travellers.